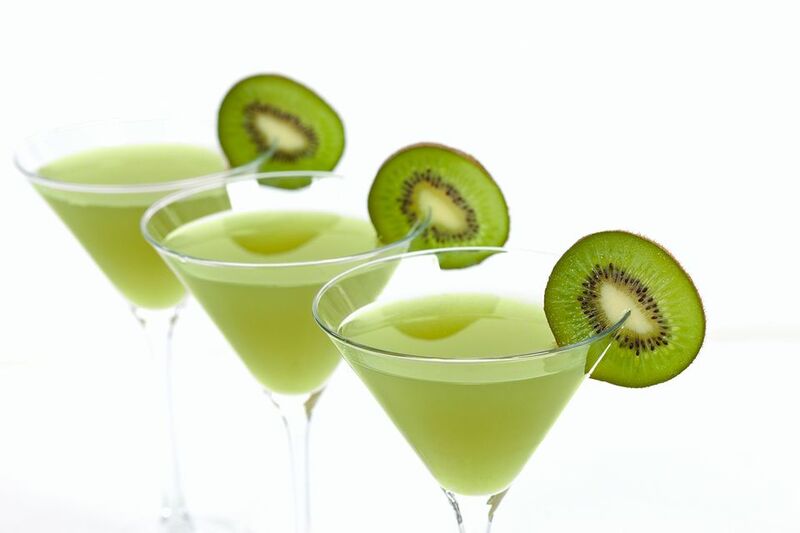 The kiwi martini is a very fun cocktail and it's one of the best drinks that makes good use of the fresh fruits. Though there are a few recipes floating around, this is one of the easiest and it's an absolutely delightful green martini to drink. For this recipe, you'll simply muddle slices of kiwi with simple syrup, then shake it with vodka. It's a drink that anyone can mix up in minutes and a perfect cocktail to show off your favorite vodka. In a cocktail shaker, muddle the skinned kiwi with simple syrup to release the fruit's juice. Garnish with a slice of kiwi. How Strong Is the Kiwi Martini? The double shot of vodka used in this kiwi martini means that this is not a weak drink. It may be sweet, fruity, and really cute, but it has an alcohol content around 34 percent ABV (68 proof). This is only slightly lower than the bottling proof of the average flavored vodka, which is typically 70 proof. Keep this in mind because drinks like this will sneak up on you. Probably the biggest challenge with the kiwi martini is skinning the fruit. It's a fuzzy little thing and the skin is not very easy to remove unless you know the secret. If you cut off the ends of a kiwi and work a spoon around the inside of the skin, all the green flesh pops right out. Once you learn this kiwi skinning technique, you will never struggle with it again. There are a lot of ways that you can play with the kiwi martini's ingredients. For instance, you can use granulated sugar rather than simple syrup. However, the syrup prevents any issues with dissolving sugar and is very easy to make at home, which is why it's often preferred for drinks. When you're making syrup, you can add kiwi juice and create a kiwi-flavored syrup. With that, you can skip the muddling process and use 1/2 ounce (or a little more) syrup. Alternatively, using kiwi syrup and muddling the fruit doubles up the kiwi flavor. While a clear or citrus vodka works really well, you may also want to try a kiwi vodka like the one from 42 Below. If you like, you can use an entire kiwi for a single drink to really ramp up the fruity flavor. This is a good idea if you want to cut back on the vodka (3 ounces is a double shot) and replace it with more kiwi juice and simple syrup. It's going to depend on your personal taste, so play with the three ingredients to find your ideal mix. While you're working with kiwi, have some extra fun in the kitchen by turning this cocktail into a frozen ice pop. It's a fun project that will turn any adult into a kid again.